Family ski holidays in France are always very popular at this time of year. At the top of the Glacier de la Chiaupe, At an altitude between 3,250 meters (10,660�feet) and 1,250�m (4,100�ft) in the village of Montchavin, La Plagne is one of the largest ski resorts in the world with has 134 slopes, 8�gondolas, 36�chairlifts�(1 8-seater, 11 6-seaters, 19 4-seaters, and 5 2-seaters) and 38�drag lifts. In the region of the 1992 Albertville Olympics there are bobsleigh, luge, and skeleton tracks�to explore. For the families, there is a snow nursery and ski school featuring an igloo village, quad bikes, moonlight skiing, ice tower climbing and more. At an altitude of 2,356�feet, Yll�s is a popular skiing centre with specialties for cross-country and downhill skiing. Yll�s is the second largest ski resort in the Lapland with 61 slopes and 29 ski lifts.� Focused on safety, children who wear their helmet while skiing receive free ski equipment rental and lift ticks. There are 5 green slopes and 34 blue, geared towards beginning and intermediate skiers. Beginners are especially well catered for with ideal terrain, good teachers and reasonable prices to cushion the shock of the cost of the expensive activity of skiing. Come in December for free Christmas dinner highlighted with a visit from Santa and his reindeer (planned for December 7, 14, 21, and 25 December 2013). In the municipality of Surselva, Laax makes it easy for families to enjoy exciting yet relaxing holidays. The area is famous for winter sports and is part of the Weisse Arena Group that combines the three resorts of Flims, Laax, and Falera. Laax was designed with your family and children in mind. While your children have fun learning to ski in the Snow Wonderland, the freestyle generation can discover the snow parks. Beginners and skiing connoisseurs can be in their element on the wide slopes of a resort with one of the highest guarantees of snow in Europe.�Laax has 29 facilities, 4 snow parks and 1 halfpipe, 235 km of slopes with 5 snow-secure valley runs, 19 mountain restaurants and 8 snow bars. There are childcare facilities and activities specifically designed for the family. Laax proudly holds the Families Welcome quality seal. Obergurgl�is a village and tourist resort in the state of Tyrol in Austria that forms part of the ski resort area of Gurgl/Hochgurgl and lies at the southern end of the��tztal�Gurglertal valley, the longest side valley off the Inntal valley. 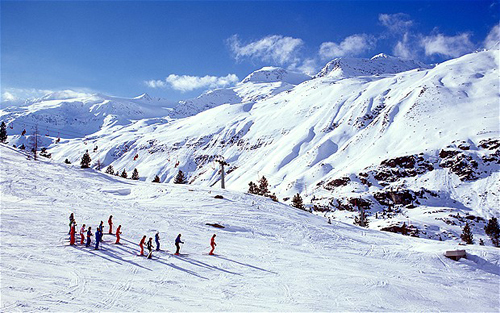 Designed for the family ski holiday, Obergurgl is one of Austria�s most famous and most sought-after ski resorts. The children�s kindergarten ski area and ski-school meeting point are now both conveniently located on the slopes 80m from Chalet Verwall. For children who have progressed beyond the beginners� stage, the blue runs of the Gaisberg provide the ideal area to move on to, and wide-open slopes and superb snow conditions make for relaxed, enjoyable skiing. After ski entertainment is more than bars and restaurants, but is family friendly with several options available. Come get away in Austria with your kids; everyone will get lost in the activities, slopes, and scenery. In the valley of Aosta, there is an alpine ski resort in the northwest region of Italy. Cervinia lies at 2,006�m (6,581�ft) above sea level, at the foot of the�Matterhorn in a valley surrounded by high, glaciated mountains and the sheer rock face of the Jumeaux. The town was built specifically as a ski resort with little care given to charm and design. There are multiple accommodations in the town that have amenities specifically designed for children. At the slopes you will find a ski school and after-skiing activities.